Senix Corporation, maker of ToughSonic® ultrasonic level and distance sensors, announces the continued expansion of Murray Irrigation’s historic irrigation automation project. 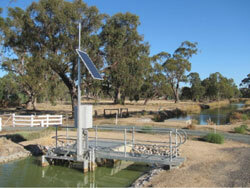 Murray Irrigation, Australia’s largest privately owned irrigation company, is automating its 3,000 kilometers of gravity-fed irrigation channels in New South Wales with over 2,200 Senix ToughSonic REMOTE 14 ultrasonic sensors to provide the level measurements that monitor water inventory and drive water distribution through irrigation gates. In 2013, Murray Irrigation began their Private Irrigation Infrastructure Operators Program (PIIOP) with a goal to significantly reduce water distribution losses. Described as a “once-in-a-generation opportunity to modernize our irrigation infrastructure and supply system,” the A$169.2 million PIIOP is intended “for the benefit of all our irrigation customers and to provide improved water efficiency and productivity for our customers’ farm businesses.” With a target completion date of October 2017, the project calls for upgrading approximately 2,200 water meters and more than 1,300 regulatory channel structures and integrating those devices through an enhanced telemetry and SCADA system. Senix ToughSonic REMOTE 14 ultrasonic sensors provide real-time water level measurements to guide autonomous and semi-autonomous channel control structures. More than 1,000 irrigation control points have been replaced since work began in 2013. In this next phase of the project, approximately 1,500 more channel control points will be replaced with sensor-driven, automated gates using ToughSonic ultrasonic water level sensors.